← Somebody Thinks My Blog is Inspiring! They say a mom always knows when something’s not right with one of her kids. I think that holds true for “fur-kids” as well. Case in point: my Sheltie. First off, he’s a big boy. He was bigger than his two sisters from the get-go and over the past almost-six years, he’s packed on the pounds. I tried to tell myself he was just big-boned. That he takes after his “substantial” mama. That his profuse coat is what makes him appear big. But you can only deny the figures so long. And the scale wasn’t his friend. 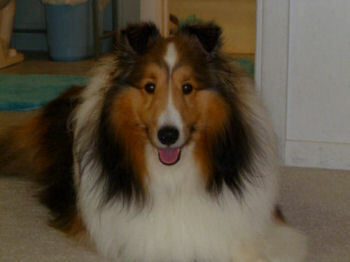 So I went on line to learn about weight gain in dogs and found that Shelties tend to have problems with low Thyroid. This condition is often undiagnosed, but it results in a less-than-luxurious coat, frequent ear infections, skin allergies, and weight gain. Hmm, sounds like my doggin, I thought. And one day my fears seemed to take over. What if something was seriously wrong, I wondered. Well, the answer came in, and it was as I’d thought — low thyroid. I’m glad to have a diagnosis. I’m glad to have been right. But mostly, I’m glad it’s not fatal. The Sheltie has to take a pill twice a day, morning and evening, probably for life. This entry was posted in Dogs and tagged blood test, dry coat, ear infections, gaining weight, listless, low thyroid, mom's intuition, Sheltie, sick dog. Bookmark the permalink. So glad it wasn’t anything worse. We do love our fur babies. They’re definitely part of the family. Mine, for sure, is. And they give so much love! He sure is a handsome lad. I’m glad it’s manageable. Thank you — me, too. Giving a pill, even twice a day, is so much easier than having to inject them with medicine. Or watch them go through chemo. Debbie, So glad to hear your fur-baby has an easily treatable is diagnosis. What a relief. Our furry friends are part of our families and are so special. He’s beautiful! You should see a big difference -a good one-once his low thyroid is corrected. Thanks, Kathy. Your words are reassuring, since I know you know what you’re talking about! I do hope the medicine kicks in and he sheds the weight — he’s almost impossible to pick up right now, ha! So happy to have a diagnosis that can be dealt with without too much trauma to anyone. But pills twice a day – oh, my. I just was sitting here thinking about trying to give my kitty a pill. I’d better be sure I have my will up to date first! She can be a cranky kitty! He surely is a pretty dog. I brought home a 40 pound bag of landscape soil not long ago. I don’t know how you pick him up at all! Barb, sometimes it feels as if he weighs a ton! To make matters worse, he’s not one of those dogs who leaps into the car unassisted. The last time I got home from the vet’s, I nearly dropped him to the garage floor just getting him out of the car. It was frightening, and the look on his face was pure terror. I knew I had to do something. I can’t imagine giving a cat a pill — the Sheltie is actually pretty good about it. So glad that if had to be something, it was thyroid. Completely treatable with medication. Pill pockets are ridiculous expensive but in my IMO very worth it. If you buy the larger size you can make one pocket last for two pills. It’s so awful when our precious furs aren’t up to snuff. Pats for Trevor. Hug for you. I’ve heard that peanut butter — or even regular butter — works great for pills, but I haven’t tried that yet. He’s doing well on my sneaking them into Pupperoni sticks, so as long as that’s working…. I’d have my thyroid checked, but in my case I think my swelling is due to Doritos. Glad your fur-kid is fine. Hi Lisa, and Welcome! I can’t blame Doritos for the Sheltie’s girth (unless he’s sneaking them at night!). Nor can I blame inactivity (unless he’s secretly logging in to my computer while I’m out of sight!). Had to be thyroid. Good thing it’s treatable — wonder when the pounds will start dropping off??! Glad he’s fixable! Good for you for keeping such a good eye on him. Aw, thanks, Lynne. It’s hard NOT to keep an eye on him when he’s under my feet half the day and under my desk the other half, ha! You’re such a good mom to Roxy! So far, he seems to be doing well, though the vet initially gave him too much and I’ve been having to gradually work our way up to that. I understand it takes a while for this stuff to kick in, so we’ll have to be patient. I read somewhere that hiding a pill in a mini marshmallow is a good trick — I’ll have to try that ‘cos my boy sure loves sweets, haha! What a scare. I’m glad it was ‘just’ the thyroid. Still worrisome to have a disease, but it is a manageable one. Even better that sneaking the pills in treats is working. Josie (the Yorkie we inherited last year) has seizure meds twice a day. Luckily my husband takes care of it because I’m not good at getting the liquid anywhere but all over her fur! Thanks, Janna. I sympathize with getting medicine down your dog’s throat twice a day — you’re lucky the hubs can and will do it! With Domer off at college, that job pretty much falls to me. You’d think the makers of dog medicines would create flavored chewables, wouldn’t you?! So glad your doggie is OK. Oh, how I’d love to snuggle up to him! Simply stunning. Thanks, Jann — he’s very snuggly! You’re sweet to be concerned, Kim — we appreciate it so much! Glad you have answers and easy treatment! Fur babies are family too! The plumber came to our house today and saw our Rascal sitting on the couch next to the hubby. He smiled, shook his head, and said, “That’s one spoiled dog.” He ain’t telling us anything we don’t already know. Best of all…he loves Momma the BEST! I bet Momma is the one what feeds him, isn’t she?! The Sheltie never met food he doesn’t like — except for lettuce. He says he’s not a rabbit! So glad to hear that it’s a treatable condition! I know how easily the worry takes over. I once took my Springer Spaniel, Shelby to the vet because I was sure there was something really wrong, like a brain tumor. She kept bumping into things. Turns out there was just so much activity in the house, what with young kids and all, that she was simply in a hurry to move to the next place and would bump into things in the process! I’d have been frantic, Terri. Yes, we’re blessed it’s treatable. He’s not too bad about accepting the pills either. Springer Spaniels are high-energy, aren’t they? Good thing you didn’t rearrange the furniture often, ha! As you know I’m scared of any animals so I know nothing about them. I didn’t know that they get the same diseases that humans get! Low thyroid!. Thank God they were able to diagnose your dog. I feel bad that your dog had to suffer with low energy and all the other symptoms. You are the best for noticing that there was something wrong. I hope he will start feeling better over these next months as his body adjust to the medication. Doggy prayers going your way! I know God cares about…animals! Thankfully, God does care about animals, Tanya! You’d be amazed at the number of dogs that I’ve heard of with cancer, seizure disorders, hip problems, eye problems, obesity — all things humans are subject to! We appreciate your prayers, especially since you have a fear of animals, and I’m trying to refrain myself from seeing improvements too soon because I know it will take a while. I enjoyed this. I have 4 fur-babies (cats, however), and I get pretty concerned if something seems to be wrong with any of them. I’m glad God cares about the animals too. Hi Tricia and Welcome! I try not to obsess over my Sheltie, but he can’t tell me what’s wrong or if he hurts. I have to be a detective and try to figure it out from his actions, and that’s not always easy. Even the vets sometimes don’t seem to know! It’s nice to meet another “fur-mom” who knows just what I’m talking about. Thanks for visiting and commenting — now I’m off to check out your blog.